the detail of the type of content an artist needs on their website - or might want to include. 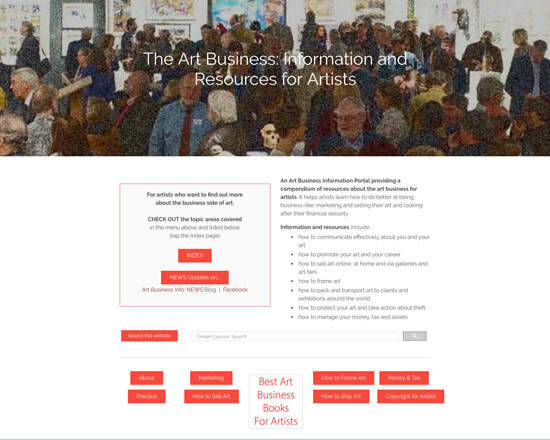 two checklists of essential pages for an artist's website and optional pages found on some artist's websites. Biography - something which tells the story of YOU - this is the "about the artist" bit. People place this in different places eg Home page or Contact Page or a page all to itself (see The Artist's Biography). At the end of this people should know where you come from, where you live now and an indication of whether you are young, middle aged or an older person. Terms and Conditions - re. compliance with eCommerce requirements/regulations if selling (e.g. commissions / artwork / tuition online). Menu / navigation - access to however your website is navigated needs to be clearly visible on every page. the artist statement, biography and CV could all be subsumed under a page called "About the Artist"
- to persuade people to look further. ​You can use it to indicate contents. Highlights anything new/current/significant about you. All images should be VERY GOOD QUALITY. Bad images or indifferent artwork do NOT represent you well or sell paintings. They also make potential buyers leave a website. it's good to have a facility which allows you to have flexible sizes for your images. First because people have different sized screens. Second because it can be good to have a smaller image for skimming purposes (plus your website works faster and ranks better in Google) and a larger image for people to study. Make sure you have a website which can handle options for how an image is viewed. You MUST organise your images i.e. curate your gallery pages. Do not mix up different types of work. Curate by year/age e.g. this year / previous years or a gallery for every year. Much less popular but used a lot by people who have been around for a long time. If you have sold work in the past. If you don't resize your images for the web you will slow down your website - and downgrade its ranking in Google. Those who have only ever used thumbnails in the past might want to view a few contemporary websites. It's much usual to use larger images these days - and to say even larger images are available to those with a serious interest in buying. Note: Keep a record of who you supply large images too, and the names of the images, filenames and sizes. Then if they turn up elsewhere on the Internet you know where to send the invoice! "Why didn't I know that was for sale?!" It's great to have a gallery ("Available Paintings") just for work for sale. via your online store (provide a link to the item in the store) - and make sure that store explains in detail how the sales process (AND returns policy) works. You can also link to an offsite blog if you prefer - but it's a good idea to tell people if a link takes them off the website. Make sure your site always looks current. News which is months old makes you look inactive and as if your site has died. See the pages within the MARKETING section of this website (links in the titles) for the information that should be included in different types of statements about you, your art and your achievements to date. If you really can't face writing about yourself then get somebody's help - there's lots out there. Include an image of you. or in front of their art in an exhibition. If you don't like the way you look in photos (I don't!) try having your photo taken in different ways e.g. by somebody close to you who won't mind if you say "That's AWFUL!!!!!" or get a professional to take a photo. You need to include different ways people can email you. People vary in terms of their attitude to sharing personal data if their studio is at home - and quite right too. You need to take reasonable precautions to avoid your email being harvested by spammers and at the same time make yourself accessible. If you do share an email I recommend you make it a dedicated one (e.g. info@domain.com) so your normal email address does not fill up with spam. I have an email which I share online - but only as an image - never as a link! Also include Facebook - but remember Facebook works changes all the time and personal accounts are not intended to be used for business. ​Only include a Facebook PAGE address i.e. a public page. Pages are ALWAYS public and are intended for use by those following e.g. artists online. Don't include your Facebook Account because that should be personal and only used for genuine friends and family. Also if you change the levels of privacy because you are concerned about the personal data being shared when it shouldn't, then you immediately make your account inaccessible to others. ALERT: Applicable laws are NOT just those generated by the country where you live! you need formal and written statements of your terms and conditions relevant to a contract for supplies of goods or services. Note that if your terms and conditions are UNFAIR and/or IRRESPONSIBLE, any relevant and applicable laws can override whatever you state. 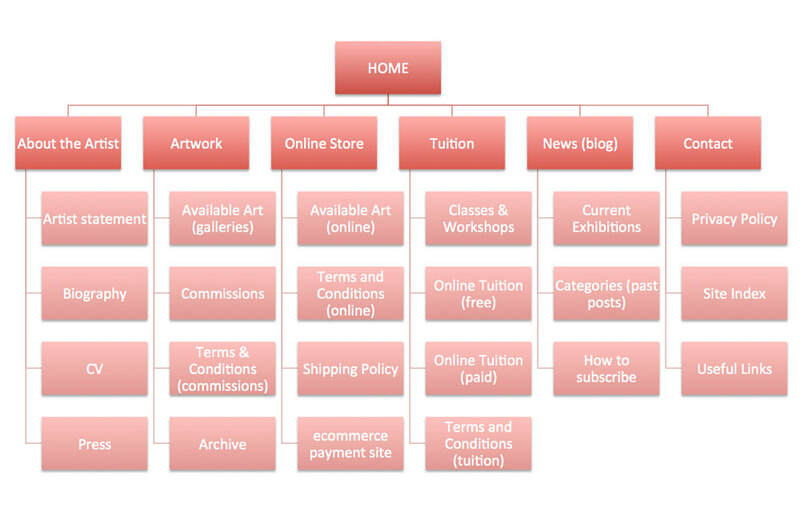 ​in relation to anything sold via your website / home / studio. A Shipping Policy is a particular and special form of Terms and Conditions where you detail what will happen and what standards will be observed - and who pays for what and when. Make sure Terms and Conditions Pages are always dated and that you keep a record of every iteration. ​You MUST have a Privacy Statement on your Website. This needs to address all the various ways in which you collect and process personal data and what security arrangements you have in place which protect such data from being stolen/ retrieved by others. The various requirements for all those receiving Personal Data from residents of the European Union are set out in the General Data Protection Regulation which comes into force on 25 May 2018. - the requirements in relation to the collection and processing of personal data relating to EU residents are mandatory irrespective of where you live in the world. People want to be more assured that visiting a site is secure - especially since Google has started marking sites as "not secure". ​A Security Certificate for your site has become essential since Google made it so. In July 2018, it started marking your website as "not secure" in the URL line if you don't have one. Effective July 2018, Google’s Chrome browser will mark non-HTTPS sites as ‘not secure’ | Search Engine Land shows you what's happening and provides some useful links. How to know if you've got a security certificate or not? if you do have a security certificate (SSL) then your domain name URL is prefaced by https:// - it has an extras 's' - for secure.